With temperatures in London soaring into the 30s at the moment, it’s so hard to know what to eat. You need something nourishing, but you’d also like something light, and you don’t want to spend ages in the kitchen preparing it (we’ve got to get out and enjoy the sunshine while it lasts, right?). So I’ve taken a little inspiration from the Middle East with this dish, after all who better to turn to than the people who are constantly blessed with these kind of temperatures! Tabbouleh is a super healthy and delicious vegan salad, traditionally made with parsley, mint, bulgur wheat, tomatoes and various spices. But I’ve put bulgar on the bench and substituted it in for cauliflower for a seriously light and gluten free salad. 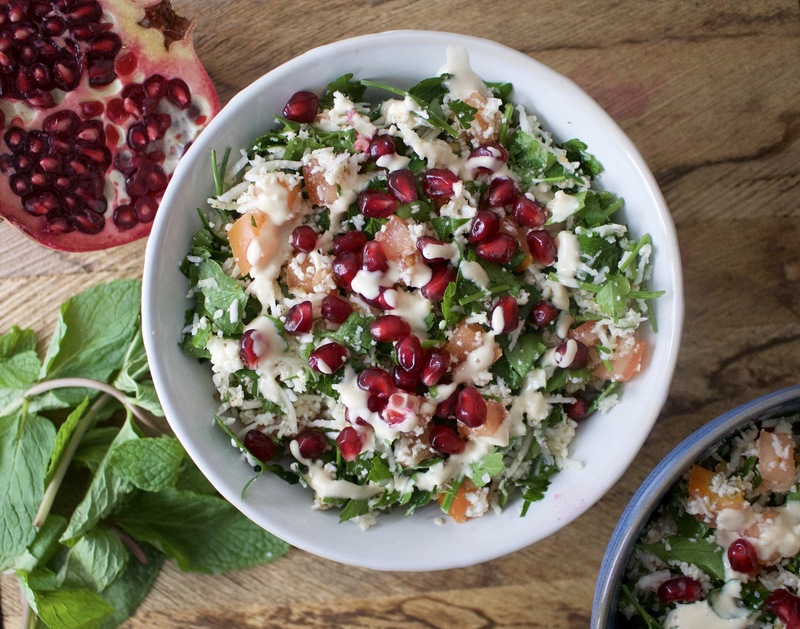 The combination of parsley, mint, tomatoes and pomegranate make this dish so unbelievably refreshing – it’s definitely my favourite summer salad! Oh and it’s bloody easy to make, which is always a win in my book. It’s perfect for picnic lunches, boozy BBQs or balmy summer evening suppers, as a main or a side dish (it goes really well with falafel, fried halloumi or lamb kofte). In a food processor, whizz up the cauliflower florets until they reach a consistency similar to cous cous. Finely chop the tomatoes, parsley and mint and combine with the cauliflower in a large bowl. Add the remaining ingredients and stir until all mixed together. 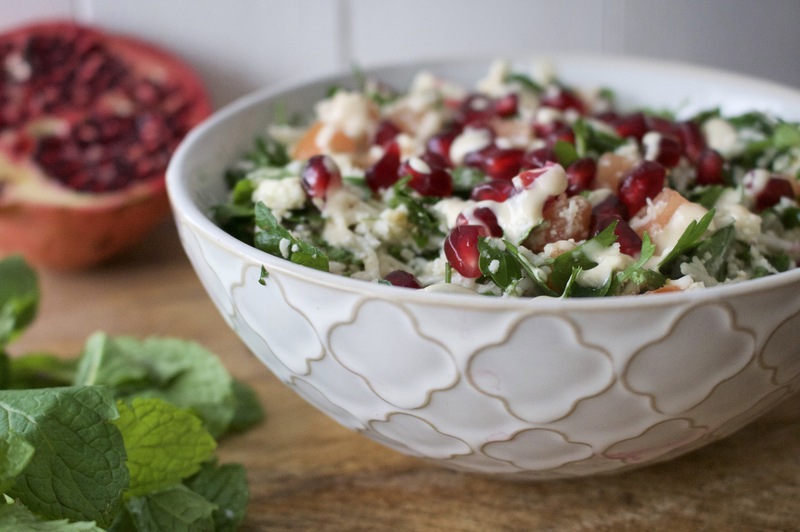 Spoon into bowls (garnish with parsley, mint, tahini or pomegranate if you like) and enjoy!